Inspired from all the panna cotta recipes I’ve been seeing on Masterchef Australia this season, I decided to give a go at this simple but elegant Italian dessert. The base of the panna cotta is just dairy, sugar and gelatine, so seems simple enough, right? Well, when done right, panna cotta is absolutely divine, but if you get your ratio’s wrong you can end up with a stiff custard, or worse, a puddle of liquid on a plate. So the goal is to turn out a silky and smooth custard that has the perfect wobble. I decided on doing a kaffir lime panna cotta only because I had a few lime leaves leftover from a Thai curry I made a few nights ago. 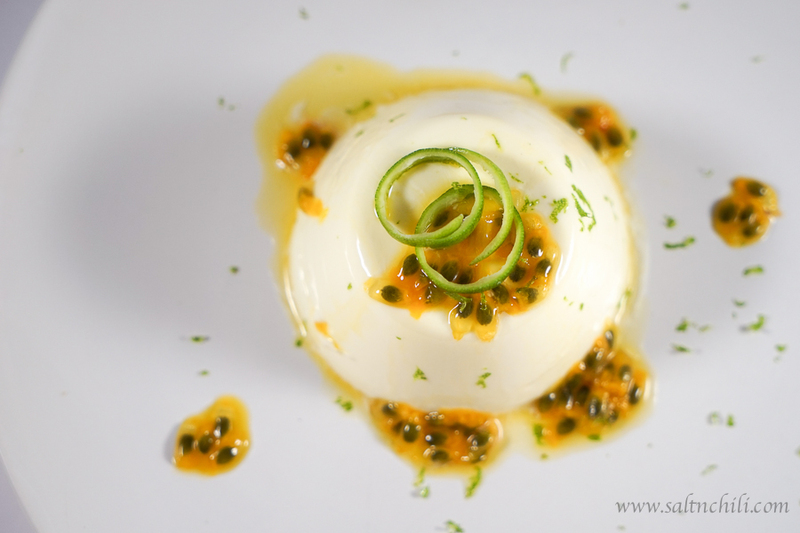 Paired with the passion fruit, this dessert turned out to be a perfect balance of sweetness and acidity. Traditionally, you infuse the cream with vanilla, but you can create your own unique dessert with any combination of herbs or fruits or anything you like. 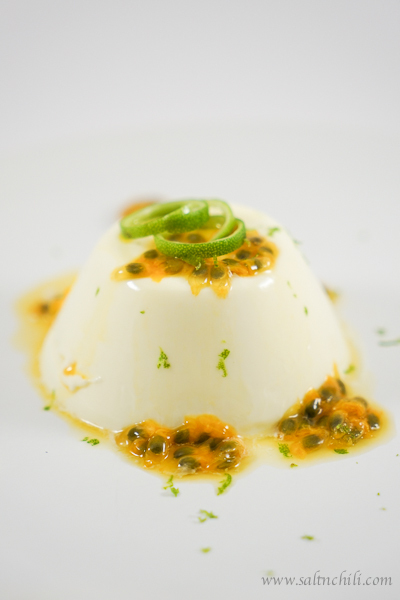 Just treat the panna cotta as a blank canvas and explore! Using a knife, cut the kaffir lime leaves in half along the joint and then crunch the leaves with your hands a bit. I find this helps with the infusing of the kaffir lime flavour into the cream. Over medium heat in a saucepan, combine the heavy cream, milk, sugar and kaffir lime leaves and gently simmer for 2 minutes, stirring occasionally. Then take the saucepan off the heat and let the kaffir lime leaves infuse for another 20 minutes. Stir occasionally to prevent the skin from forming over the cream mixture. In a large bowl sprinkle the gelatine over the cold water and let sit for 5-10 minutes. Pour the warm cream mixture over the gelatine and stir until the gelatine is completely dissolved. Strain and divide the cream mixture into the prepared cups (I like to use stainless steel ones) and then chill in the refrigerator for at least 3-4 hours (I usually leave it overnight). When ready to serve, dip the panna cotta cups into hot water for 2-3 seconds and turn over to unmold onto a serving plate. 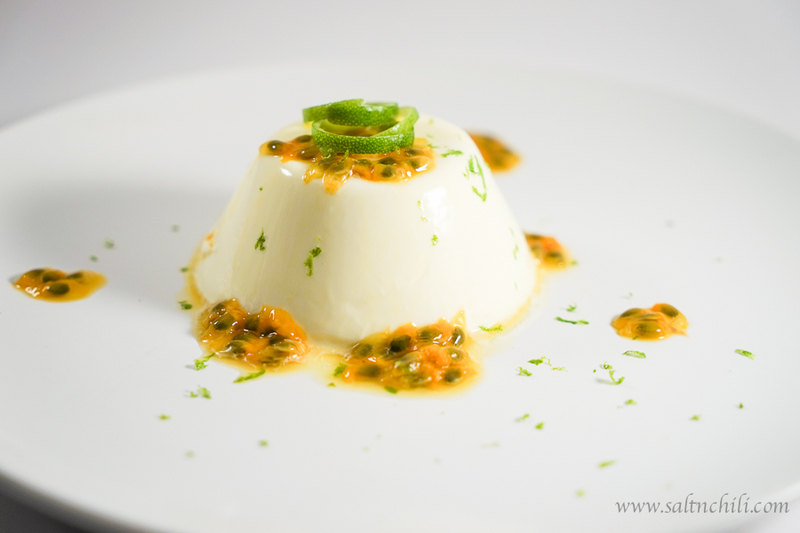 Cut the passion fruit in half and using a spoon, scoop out the passion fruit pulp and drizzle over the panna cotta. Garnish with some lime zest. « foodpanda: Food delivered to your doorstep!